It's finally here! We have had so much adventure at our house over the past week. Dinomite has moved back into Bulldozer's room, after trying out his own room for a few months. (He missed his brother.) I have my classroom and storage area back. Hooray! Contractors have been at the house, putting in new counter tops, a sink, lights in the kitchen, a light in the bathroom, new front porch steps, and fixing our roof and chimney. Everything is looking great, but the process has wreaked havoc on our routines and daily schedule. I'm super excited about our second week "in the kitchen." If you enjoy it as well, don't forget to start following me here or liking me on facebook. I love getting to know my readers! We're writing spelling words in pudding this week. I've selected a different flavor for each day to add some taste testing to the process. Source: The printable for this activity is part of my In the Kitchen Unit Part 2 Language Printable Pack. Click on the link at the end of this post for your free copy. The kiddos will review some phonograms, matching up the phonograms to the correct pictures on the chart. The kiddos will match up the 3 part cards, learning the names of electrical appliances in the house. Note: I'm getting a little bored with the same types of language activities each week. It seems the kiddos are too. They don't touch the nomenclature cards very much at all anymore. Spelling is varied, so that keeps things fun, but language materials seem to be the least favorite right now. Perhaps this week will be different. We'll see. Measuring Volume in the U.S. Using the chart provided, the kiddos will match up the containers with the correct labels to learn volume amounts. Source: The printable for this activity is part of my In the Kitchen Unit Part 2 Math Printable Pack. Click on the link at the end of this post for your free copy. The kiddos will pour contents of each container, one at a time, into the measuring cup. They will then weigh the contents, matching each container with the correct measurement card. I love that this activity will also help them practice their pouring. The kiddos will decide which fractions are bigger and smaller, using the measuring cups provided. They will place the tokens on the correct answer on each card. The idea for this activity came from Princess' favorite episode of Dora the Explorer. Kiddos will look at the 3 ingredient recipe cards and match them up with the final product cards. Obviously, not all ingredients are included for each recipe, but the main ingredients are. I'm super excited to see how the kiddos do with this activity. I'm guessing Princess will really enjoy it. Source: The printable for this activity is part of my In the Kitchen Unit Part 2 Culture & Science Printable Pack. Click on the link at the end of this post for your free copy. During our last week "in the kitchen," we learned about herbs used in cooking. This week we're learning about spices. The kiddos will match up the spice jars with the cards provided. They are welcome to smell each of the spice jars. The kiddos will separate the cards into three categories: hot, electric, and sharp. (Some cards are printed twice because they fit in more than one category.) 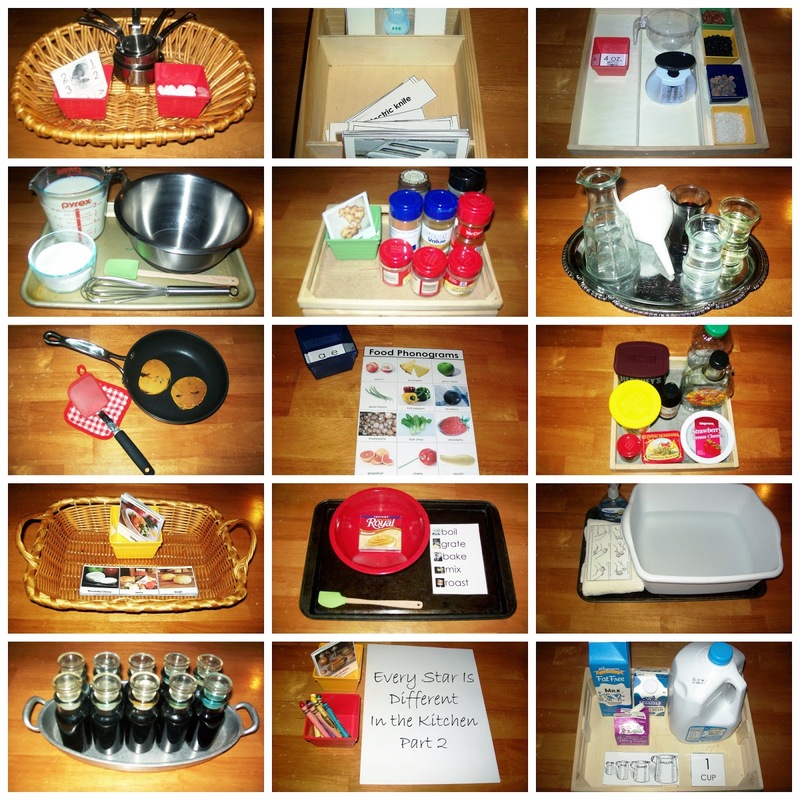 As we do this activity we will talk about kitchen safety, reviewing how to stay safe in the kitchen. Mixing liquid ingredients in the kitchen is a great way to introduce the kiddos to the concept of density. In the three glasses are water, oil, and Karo Syrup. The kiddos will practice pouring the contents of the glasses into the container provided, using the funnel. No matter what order the kiddos pour the ingredients, they will separate by density. It should be really fun for them to see. I'm guessing Bulldozer will think this is the coolest thing ever. The kiddos will look through the still life art cards provided, comparing them. Then they will go to the kitchen to gather items they would like to draw in their own still life picture. Crayons are provided for them to draw with. It should be interesting to see what they choose to draw. Dinomite chose this activity first this week. This is his first drawing. We continue to sing each day, learning a new song each week. The kiddos also continue to practice the piano each day. The kiddos continue to participate in our family fitness exercise program. The kiddos will use the two ingredients and tools provided to make instant pudding. They will then use the pudding for their spelling activity the next day. The kiddos will practice opening and closing the containers. I've put a little treat in each of the containers for them to eat when they open them. This is the only way I can think of to get Bulldozer to attempt this activity. The kiddos will match up the scented bottles, as they smell them. I created the scented bottles using extracts, water, and food coloring. The kiddos will practice flipping pancakes using the spatula and potholder provided. When they're finished, they are welcome to eat one of the pancakes. My kiddos love plain pumpkin chocolate chip pancakes. The kiddos can select a game to play in the pamphlet provided, using the materials in the bin. Each day I will introduce them to a new game. I'm hoping they'll have fun with this. I thought it would be good to review our washing hands sequence with the kiddos as part of this unit. Especially as we're teaching them the importance of washing their hands before they work in the kitchen. Next week we'll be studying Australia! I hope you have a fabulous week! For those interested in the printables, click on the links below. Thank you so much for your comments. I love them! Wow! I love how you have tied all the different subject areas and practical applications into the kitchen. How many activities are you able to do each day? Will you repeat some? Thanks Sara! All of the activities are on the shelves everyday for the kiddos to choose from. They always do each one at least twice during the week. I find they learn the best this way. Such fun! My daughter would love if we did every bit of school around the kitchen. Thanks for sharing at The Mommy Club Link Party! So many great ideas! And, such a fun way to learn what real life skills! Great ideas! Thanks for sharing them! Such amazing ideas! I wish I had started things like this with my kids when they were smaller! Such fun ideas! My kids love helping in the kitchen. These would be great to try. Again you blow me away, Renae. Your printables are of such amazing quality - and I cannot believe the variety of activities you come up with. Great ideas! Your kiddos are so lucky to have you as their mom, and we're so lucky you share with the rest of us! Thanks for posting this at the After School Linky! Great, I love your ideaa. What is the age of your kids?